The new year brought with it a change in technology. We had been working on building our games for Flash using Actionscript 3 and Flixel. That is a very powerful pair of techologies to work with, if you want to target the web almost exclusively. However, our goals are to eventually target desktop environments as well as mobile phones. While it is possible to work with Actionscript to target those environments, it would require us to use something like Adobe Air. However, that technology is not particularly liked nor does it have continued support for Linux. So we needed a change. Lucky for us, some awesome game developers ported Flixel to a very Actionscript like language called Haxe. HaxeFlixel has made it possible for us to fairly easily port our existing code, which honestly wasn’t a whole lot, and get ready to target all the technologies that Haxe targets. By using HaxeFlixel, we will be able to create the types of games we want to make and bring those games to the web, desktops and mobile devicess. I have completed February’s goals and look forward to tackling March’s. I already have some great ideas on how to tackle some of the problems I had been facing previously when it comes to the tokens. A lot of that will be done outside of Haxe, though, as I will be creating some game tools for us to use. As for Willis, his portion of Demon’s Hex is mostly completed and at this point he is working on things for it on an as needed basis. So he will be working on expanding his craft and learning to better utilize some tools that we plan to use on our next game. A lot of this is animation. I look forward to seeing what he does in that regard and plan to show them off when I can. 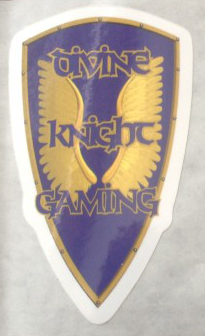 Buy one of our Divine Knight Gaming stickers to support our game development work. $5 each. Want the latest updates on our games and other neat updates? Welcome to Divine Knight Gaming. We are a game developer dedicated to creating great games for Linux, Mac, PC and Mobile. Feel free to explore our blog and forum to discover what we are doing in the world of game development.